Saturday’s Los Angeles Times features a story on the short life and horrific death of Kirsten Brydum, a 25-year-old woman who, in the tradition of Jack Kerouac, set out last summer on a two-month road trip that ended with her murder in New Orleans. Brydum, the story says, “arrived in New Orleans in late September with a rail pass, a little red notebook and a head full of ideas about the oppressive forces of capitalism and government, and how they might be replaced with something better.” She hoped to contribute to the post-Katrina rebirth of New Orleans. Instead, she was shot four times in the face and dumped in the city’s 9th Ward. The murder remains unsolved. I must emphasize that in writing what follows I am not blaming Brydum for the fate that befell her. In an ideal world a lone petite woman should be free to roam about as she pleases without fear. But it is not an ideal world, and few cities in America are as far removed from the ideal as is New Orleans. Which brings me to the point that some may find objectionable and even insulting to Brydum’s memory. No insult is intended, but if Brydum’s death is to be remembered as anything other than another unsolved murder in the country’s most dangerous city, one must draw the lessons one can from the tragedy. Brydum was a woman of the political left, which I again say is not to relieve her killer from even a trace of moral culpability for her death. But among the criticisms we conservatives have of people on the left is their naiveté when it comes to responding to evil. Modern liberals, as contrasted with pre-1960s liberals, often seem unable to respond to or even recognize malevolence when it presents itself. The results can be disastrous, both for individuals and for nations. In my long career as a police officer I’ve counseled the young cops I’ve been entrusted to train that they should not go about in the belief that everyone out on the streets will try to kill them. But neither should they forget that there are people out there who, if given the chance, will. You don’t have to be a cop to take my advice. Radley Balko‘s latest article in Reason tells us once again of how the U.S. fight against illicit drugs is destroying people and property. He cites both anecdotes which support his position, as well as general trends. Sadly, the general trends he cites are misleading at best. Balko makes four claims: The drug war militarizes our police, enriches our enemies, undermines our laws, and condemns the sick to suffering. Police in large cities formerly carried revolvers holding six .38-caliber rounds. Nowadays, police carry semi-automatic pistols with 16 high-caliber rounds, shotguns and military assault rifles, weapons once relegated to SWAT teams facing extraordinary circumstances. Concern about such firepower in densely populated areas hitting innocent citizens has given way to an attitude that the police are fighting a war against drugs and crime and must be heavily armed. If only we had police shooting and fatality statistics from some large police force. Oh, wait! We do! Fox News reported on a massive decline in total shootings. Accidental shootings were way down since 1996. 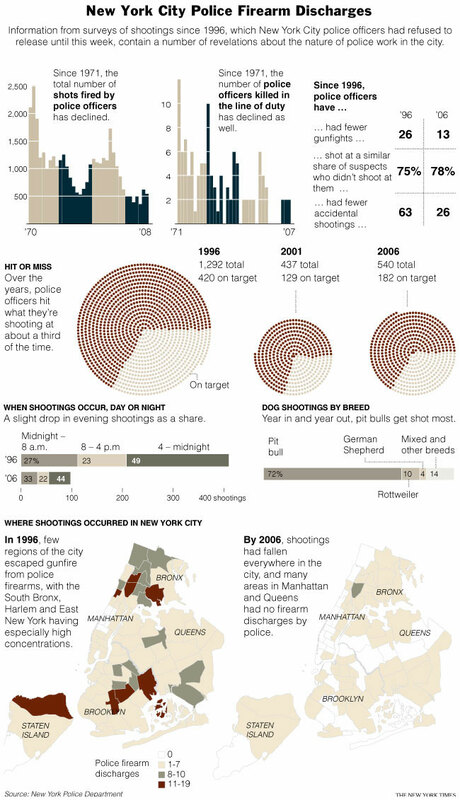 Police shootings involved about the same number of shots per event. Did I say Fox News? I meant the New York Times. Sorry. I get them confused a lot. So, we have fewer shootings, fewer cops killed on the street, and fewer accidental shootings. One might suspect that this would lead an observer to conclude that police forces are getting better, if one looked at the actual data, rather than making it up. If you look at a graph of the U.S. murder rate going back to about 1915, you’ll notice a few interesting patterns. There’s a spike at around 1919, just at the onset of alcohol prohibition. The graph then takes a dramatic dip in 1933, just after the repeal of prohibition. There’s then another spike in the late 1960s, just as Richard Nixon took office and fired the first shots of his war on drugs. That spike falls in the 1970s as President Carter took a less militant approach to drug prohibition, but then with Reagan’s reinvigorated war in the 1980s, it begins another upward ascent. Balko cites this chart for his claim as to the murder chart going up. The chart stops in 1997. Fortunately, I was able to locate this really neat thing on the internets called Google. You can use it to find data, like the fact that the murder rate in 1997 of 6.8 per 100,000 people was a dropoff from prior years, that Balko’s claim that Reagan’s anti-drug efforts led to more murders (the answer, by the way, is fewer) and even that they kept data past 1997 – when the murder rate continued to drop, stabilizing at 5.6 per 100,000 over the last few years. That’s the lowest rate since 1965. Balko claims that the current Mexico drug issues are caused by America’s unwillingness to import delicious drugs and its funding of drug interdiction efforts. I can’t help but notice that in those countries where hard drugs are either de facto or de jure legal, crime seems to be worse. Mexico’s lack of enforcement of the drug laws (primarily due to widespread corruption) hasn’t led to peaceful drug lords. It’s led to drug lords killing each other and everyone else. I’m a utilitarian, and I disagree with the latter argument. When people like Balko use dishonest arguments to further this position, it doesn’t do much to make me think there’s merit somewhere there. Kevin Roderick reports that the L.A. Times‘s scrapping of its California section will be accompanied by 70 more newsroom layoffs — about 11 percent of the remaining newsroom staff. We’re watching death in slow motion. The latest news out of Gitmo is that President Obama’s efforts to delay existing cases have only been partly successful. It’s not clear what will happen, but it seems likely that some people who are guilty will go free. Through all of it, the real problem, it seems to me, has not been malice, but incompetence. The latest declaration by a former JAG prosecutor at Gitmo, this by Lt. Col. Darrel Vandeveld, talks about the lack of central prosecution files. Vandeveld, by his own declaration, doesn’t appear to have been as alarmed as one might be over that, until he began to have doubts about the merits of his cases. The declaration is filled with inflammatory language that belongs in an argument, not a factual declaration. But the underlying issue – that comprehensive files just weren’t kept, and that the things you’d want in a prosecution file are scattered to the four winds – is absolutely alarming. These accusations appear to be bolstered by other declarations – Lt. Col. Stephen Abraham said similar things in his declaration; he was working as a defense attorney. Obama’s people supposedly “discovered” this problem when they came into office, but there had been public allegations of this sort of thing before. This isn’t an issue of politics. This isn’t an issue about who should, or should not be held. This is, straight-up, an issue about competence. In a prosecutor’s office, here’s what happens, in theory: We get all the information, and put it in a file. On big cases, our office PDF’s the files and sends everything we have (videos, audios, transcripts, statements, police reports) out on disc. The cops have copies of the stuff they generate, and we have copies of everything. The physical evidence (like, say, shotguns) are kept in evidence by the cops. The prosecution or defense can come look at it. If you want to have prosecutions, you have to have proper case files. In this sort of situation, you’d disclose to the defense what you legally could and keep a privilege log of those things you couldn’t. And when you don’t, and you need a delay because, well, you have no freaking clue what’s going on, the judge will be predictably grumpy. This failure, I think, is one of the key reasons why the detainees have included some number of people who are not guilty of the crimes alleged, and why some terrorists will go free. So, now’s the time to do the right thing: Assemble case files. Make viable cases against people who murdered Americans. If you can’t make those files, those people are going free. That’s an affront to the dead, and to the living. And all because no one cared enough to do some work that was primarily clerical and organizational in nature. Am I wrong on this? What do you think? Mrs. Dunphy and I have been working on our taxes this weekend, and like most taxpayers, I suspect, we were shocked to discover just how much of a claim the government has made on the fruits of our labors. And we were also wondering what might happen if the IRS were to discover that we had come up, oh, let’s say $128,000 short in paying our obligations as citizens. Would anyone – anyone! – take us seriously if we were to claim it had been an “honest mistake” as Tom Daschle now has? And can you imagine the harrumphing and caterwauling from such as Chuck Schumer and Carl Levin and Maureen Dowd and E.J. Dionne and all the usual suspects if it were Republican nominees being paraded out so heavily freighted with ethical lapses of the kind we’ve seen with Daschle, Tim Geithner, and Eric Holder? Are Two Pictures Worth Two Thousand Words? In Patterico’s absence this weekend I’ll try to keep an eye on one of his favorite targets, the ever-shrinking Los Angeles Times, known in these quarters as the Dog Trainer. In clicking about on the Times’s website today, I was struck by their choice in photographs used to announce the selection of Michael Steele as the new chairman of the Republican National Committee. In watching Mr. Steele on television, I’ve always found him to an affable enough fellow, yet on the Times home page they chose to use this photo. Those who clicked to the story were greeted by a photo of Steele in the more characteristic mien shown below, but I can’t help but wonder how many people simply glanced at the home page and were left with the mistaken impression that he is an angry man. In two earlier posts (here and here) I discussed the harebrained decision by LAPD command officers to send cops without helmets and face shields into a Jan. 10 skirmish with pro-Palestinian demonstrators at the West L.A. Federal Building. The wearing of helmets, the officers were told, was too “intimidating” for the delicate sensibilities of those who wish to see Israel eradicated. An officer was injured, though not seriously, when he was struck on the head with a protest sign. The responsible command officers have been trying to rehabilitate their credibility with the rank and file, so far with little success. Now the Los Angeles Police Protective League, the labor union representing officers below the rank of captain, has filed a class-action grievance against the department, citing LAPD policy and various city and state laws regarding the use of protective equipment. (Full disclosure, but to no one’s surprise, I am a member of the LAPPL.) The grievance seeks to ensure that officers will not be needlessly exposed to such risks in the future. And on Wednesday, the Los Angeles city council approved a $20.5 million settlement to be paid to four LAPD officers wrongfully, indeed shamefully, treated during the investigation of the department’s Rampart scandal. (I discussed the case at National Review Online here and here.) At last the officers will collect the monetary damages they so richly deserve, but to paraphrase Ray Donavan, where do they go to get their reputations back? I may not be posting this weekend. JRM has promised to step in with a post or two, and you never know when you’ll hear from Jack Dunphy or Karl, both of whom have popped in once or twice in recent days — something I have been very pleased to see. The publisher decided to fold local news inside the front section — which will be reconfigured to downplay national and foreign news — despite what an official of the paper confirmed for me w[ere] the unanimous and vocal objections of senior editors. [Publisher] Hartenstein reportedly planned to delay an announcement until the close of business on Friday, fearing it will play as another black eye for the Times. He’s right about that. The paper recently raised the price of an edition of the paper from 50 cents to 75 cents. Pay more, get less. How can you pass up that deal? This fellow begs to differ, saying that L.A. Times pressrooms “produce six sections on every press run.” Me, I have no idea who’s right. All I know is that the long-term trends for this paper are not good. UPDATE: At the L.A. Times, the news is being reported on a blog — as a “Kevin Roderick reports” type of story. (Gee, we don’t know here, but Kevin Roderick tells us that our own paper is cutting the local section!) And the headline is “Hollywood papers struggle; L.A. paper loses local news section.” “L.A. paper,” eh? Which one would that be? Pathetic. I guess the paper is being stubborn about saving the official announcement for the news black hole of Friday afternoon. I was hoping to avoid making an announcement about this, but commenters are asking questions. Some of you have noticed that DRJ has not been posting lately. She has decided not to post or comment on the site any more. She says this decision is permanent, but I will always hold out hope that she will change her mind, so let’s treat this as a hiatus of undetermined length. If she wants to share the reason she may. She and I still get along great (how could we not?) so that’s not the problem. I don’t really want to talk about it; I’m afraid I’d say something I’d regret. Anyway, I would like this to be a positive post. Please let DRJ know how much you appreciate all she has done for the site. I extend to her my deepest personal thanks — thanks I can’t adequately express in words — and my wishes for an ongoing friendship. She is one of the finest human beings I have ever (sort of) met. I hope one day I can remove the “sort of” from that statement.